Stewart A. Baker -- attorney, podcaster, and first assistant secretary for policy at the U.S. Department of Homeland Security -- delivered the keynote address at the 15th Annual Georgia Tech Cyber Security Summit in Atlanta, describing challenges of attribution now and why he believes 2017 could be a turning point. Is the ability to identify a cyber attacker good and getting better? At the Georgia Institute of Technology on Wednesday, Stewart A. Baker, the first assistant secretary for policy at the U.S. Department of Homeland Security, proposed that 2017 might just be a transformational moment in the quest for better cyber attribution. “We are entering a golden age of attribution where perpetrators are increasingly being called out with reasonable certainty; but while the brave have gotten a lot of press out of it, will they regret their business approach and are their methods good enough and specific enough to be useful?” said Baker, who delivered the keynote address at the 15th Annual Georgia Tech Cyber Security Summit held Sept. 27. Today, he is a partner in Steptoe & Johnson LLP. Baker reviewed four problems with attribution now: the balkanization of security, limited incentives to do attribution, speed of response, and availability of tools. He called for “data man traps” and cyber “beacon die-packs” like those used by banks that could make it easier for law enforcement or intelligence communities to locate cyber hackers. Organizations are beginning to publicly voice who they suspect is behind highly publicized breaches. Sony Pictures identified North Korea as their culprit. The Democratic National Committee identified Russia. 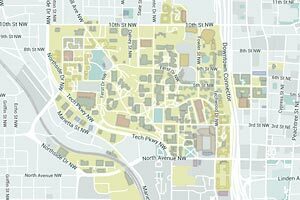 Meanwhile, universities such as Georgia Tech are working closely with government sponsors and commercial partners to develop an initial science of traceback around how attribution should be performed. 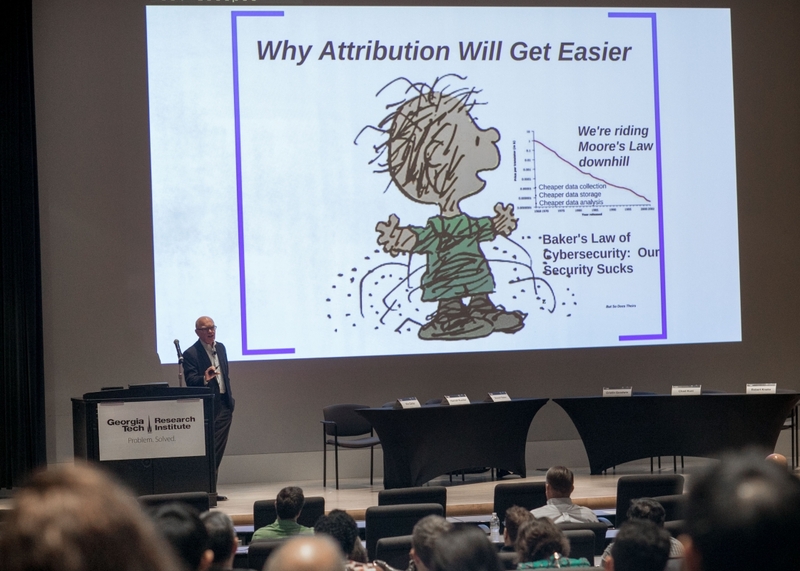 “Georgia Tech is building frameworks for attribution so that others can leverage our approach by applying their own data and analyzing the result,” said Michael Farrell, Co-Director of the Institute for Information Security & Privacy (IISP) and organizer of the Summit. But once analyzed, key questions still remain, even when methods are sound. What is the right response when facing a nation-state hacker versus the individual criminal? What does it mean to hold nation states and companies responsible? How should the private sector use attribution information to better defend themselves and mitigate risk? What if government is wrong when it claims who is behind an attack? In addition to Kuchler and Knake, the panel included Kim Zetter, investigative journalist and author of a 2014 book about the Stuxnet virus; Cristin Goodwin, assistant general counsel for Microsoft Corp.’s security business, and Chad Hunt of the FBI’s Atlanta office. “What are the private actions that are available to companies?” asked Goodwin. “There are different standards of evidence when talking about attribution of individuals or groups of actors. Hunt said he finds most companies don’t actually care who is behind an attack; they “want to know what resources they’re up against” and if their technical investments are enough. Zetter, who has covered cyberwarfare and hacking since 1999, challenged whether governments should rely on private companies for attribution assistance. “When you have the government relying on third-party companies for evidence, I think we’re getting into really muddy ground,” she said. The choices available to executives, law enforcement, front-line cybersecurity practitioners, and diplomats present unique facets to the problem of “what to do next” after a breach, said Farrell.